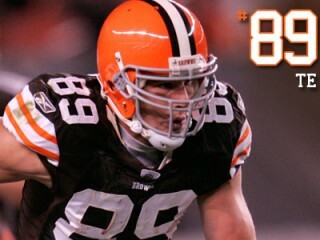 Evan James Moore is an American football tight end for the Cleveland Browns of the National Football League. Originally signed by New Orleans as an undrafted free agent on May 5, 2008; Waived by New Orleans on May 13, 2008; Signed by Green Bay on May 22, 2008; Waived by Green Bay on September 5, 2009; Signed to Cleveland's Practice Squad on November 9, 2009; Promoted to active roster Dec. 5, 2009. Elevated to the 53-man active roster on December 5 after spending the previous three games on the Browns’ practice squad, after being signed on November 9… Was in training camp with Green Bay before being waived on September 7… Played in five games in a reserve role and had 12 receptions for 158 yards. Game 1 vs. Minnesota 9/13: Not on roster…Game 2 at Denver 9/20: Not on roster…Game 3 at Baltimore 9/27: Not on roster…Game 4 vs. Cincinnati 10/4: Not on roster…Game 5 at Buffalo 10/11: Not on roster… Game 6 at Pittsburgh 10/18: Not on roster…Game 7 vs. Green Bay 10/25: Not on roster…Game 8 at Chicago 11/1: Not on roster… Game 9 vs. Baltimore 11/16: On practice squad…Game 10 at Detroit 11/22: On practice squad…Game 11 at Cincinnati 11/29: On practice squad…Game 12 vs. San Diego 12/6: Made NFL debut, in a reserve role, and tallied six receptions for a team-high 80 yards with a long of 18… Of six receptions, four were good for a first down, including a 13-yard catch on fourth-and-10 in the fourth quarter… Game 13 vs. Pittsburgh 12/10: Hauled in two passes for 34 yards, including a 24-yard reception on third-and-10 from the Browns’ 38 in the first quarter… Game 14 at Kansas City 12/20: Caught one pass for seven yards… Game 15 vs. Oakland 12/27: Had one reception for 19 yards… Game 16 vs. Jacksonville 1/3: Hauled in two passes for 18 yards in a reserve role… His 14-yard catch on third-and-4 from the Browns’ 31 in the fourth quarter kept alive a drive that led to a Phil Dawson 33-yard field goal. Had 103 receptions for 1,555 yards and 12 touchdowns in 38 games for Stanford (2003-04, 2006-07). View the full website biography of Evan Moore.